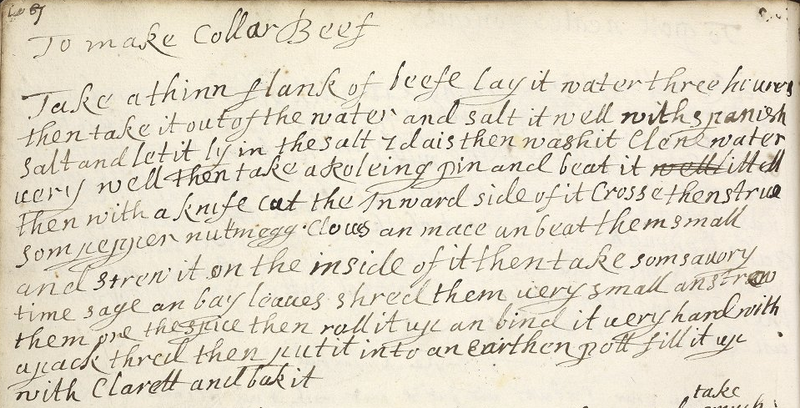 Cooking in the Archives has a new archival recipe, Collar Beef. Collar Beef is essentially a butterflied flank steak, rolled up with herbs and baked in red wine. Beautiful photography! Still looking forward to new posts. Keep it up! I made this and the husband and I really liked it, though we think the cloves are a bit too much for us and will be toning those down next time 🙂 Fantastic stuff. Thanks for cooking and sharing! Let us know how your friend likes the carrot pudding if you try it as well. Just a thought, but “saory” might have been the herb savory, which is similar to sage. Yes, “sauory” is the herb savory as we note in the link above. I recall savory being readily available in supermarkets in the UK, but we were not able to locate any at the Philadelphia supermarkets and farmer’s markets we frequent. I didn’t see any link above? I am also using a very old version of android, so websites don’t always display properly! If you are referring to the other comments regarding savory, pls note (and I sound like a b**ch saying this) but I replied first? Anyhoo. I am dying to try this recipe myself. I can’t find savory in Houma, La. so will try with sage. There are also no butchers here. Period. Any tips offhand for butterfly-ing the steak myself? If not, I can google it. Thank you for taking time to reply! I look forward to more culinary explorations! In the US you can get “summer savory”, but it is not like sage. “Sauory” is Savory. The herb. Wouldn’t the herb “sauory” be the herb “savory”, as in winter savory, or summer savory? The “U” is the way a “V” was written in English at that time. (English spellings were not standardized). It is NOT a “U”(! ), as everyone above keeps asking. Also, it’s possible the recipe said, some “savory thyme” (also spelled “time”), sage, and bay leaves”. I found 29 varieties of Thyme; some are sweet and some are not, so it is possible the recipe was specifying one of the more pungent varieties. “SAVORY” (winter savory and summer savory) is a European MINT. I would really encourage any makers to this recipe to track down whole leaf savory (but dried & rubbed will totally work in a pinch.) But as someone who has made this dish (cripes, it was almost 15 years ago!) fresh bay leaves totally made it. Alternately, I have seen ‘Boef Collars’ also calling to be seethed over fyre (pan fried) & basted in red wine with an herb bundle. But great job in translating the technique. Thanks for letting us know! Next time we’ll definitely make sure we have fresh bay leaves on hand (and continue in our search for the illusive savory.) We’re curious about how you came to cook this recipe almost 15 years ago? Was is from a different historical source? secondary source materials, I didn’t have the graduate level clearance to handle the “real things.” And widespread scanning & downloading was not available. I found this recipe, I think (it was a long time ago) as part of a microfiche reel I checked out. [No showing my age there] I do believe there is also an almost identical recipe in Sabrina Welserin’s medieval cookery book. I hope that helps shed light– it’s been a long time, as my historical cooking is now focused on the period of the American Civil War & mid-Victorian cooking. PS. I grow savory in my kitchen garden. Seeds can be found http://www.burpee.com. This is a fascinating blog. I am very interested in making the collar beef, it sounds delicious. Thank you for sharing. I stand corrected. In the US that is the equivalent. However, we would need to add something “peppery”, like mint. What’s the significance of “spanish salt” in this recipe? Does it simply mean salt that is from Spain? And, if so, why was the origin important? Was “spanish salt” even salt at all? The French for “allspice” is “Jamaican pepper”. And “Sichuan pepper” (aka “Chinese coriander” or “prickly ash”) isn’t even related to black pepper (or any sort of chile pepper). Just because these things are called ” pepper”, doesn’t meant they’re actually a variety of plain “pepper”. So, I could easily see “spanish salt” being something completely different from “salt”. Then again, I could also easily see it simply meaning salt imported from Spain. Any insights into what the recipe is actually looking for you to marinate your meat with would be appreciated! The cooks who wrote this recipe used both summer and winter savory–an herb that is worth looking for. Penzy’s spices carries it–although they do not say which one is it. Summer Savory is an tender annual, and Winter Savory is a perennial. I’m guessing they used Winter Savory. It is useful in bean dishes, as Penzy’s points out. I haven’t made a video of this recipe, but it would be great if someone did! I hope the process photos help somewhat.